"Can somebody just let me out of here? If I die in a cage, I lose a bet." No need to worry, Rick, because you're in a Funko Rick and Morty Mystery Minis box! The Series 1 set features the entire Smith family along with creatures and friends from the sci-fi animated series. 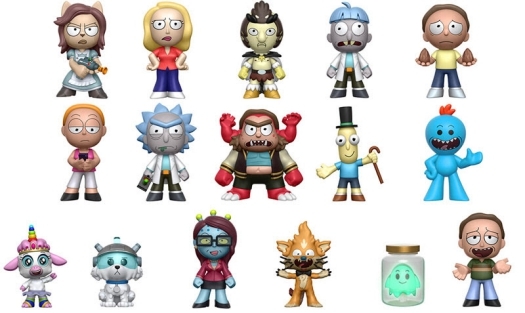 The Funko Rick and Morty Mystery Minis line adds several new characters to collect that are not included (yet!) in Pop! form, although a few minis resemble their larger Funko Pop Rick and Morty figures, such as Doofus Rick and Morty holding seeds. Arthricia with her cat-like ears, the hivemind Unity, and Tinkles, who is Summer's imaginary(?) lamb with a rainbow unicorn horn, are among the other options. While the blind-box format keeps collectors in suspense, it also presents a slightly more difficult task for those seeking to complete the full set. 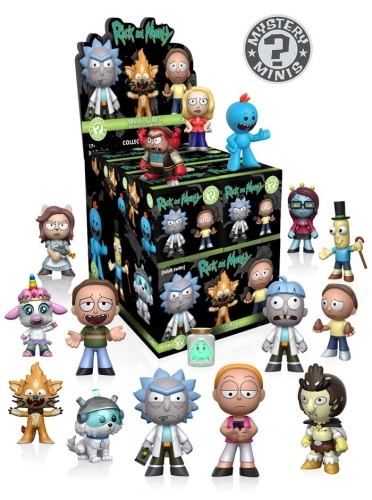 Including the Hot Topic and Target exclusives, there are 22 Funko Rick and Morty Mystery Minis Series 1 figures, each pulled at different odds. The specific odds for Funko Rick and Morty Mystery Minis are noted below. Shop for Rick and Morty Mystery Minis Boxes and Cases on Amazon. Review additional Funko Rick and Morty options with other detailed guides. Any updates on the odds or any exclusive figures? We won’t likely see any updates until the product releases. There are only supposedly only 8 figures listed, so I’m betting there are 2 to a box. So I purchased a whole case from amazon and either Funko or the seller are trying to make more dollars. double one figure. No ghost in the jar or unity or morty jr and mr meeseeks. Sad. Really was hoping to get the whole set and didn’t want to buy individually. I have every single character including all exclusives from series 1 and 2 mystery boxes how much is my set worth? All figures near mint or mint depending on your definition for these mystery figures. FUNKO Rick & Morty MYSTERY MINIS SERIES 1 SEALED CASE of 12.